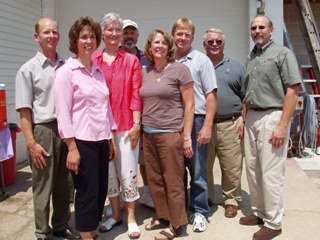 A small group of Wisconsin dairy graziers have joined forces to create a new cooperative to craft specialty, grass-based cheese from the milk of their rotationally-grazed dairy herds. The new Edelweiss Graziers Cooperative combines the craftsmanship of Master Cheesemaker Bruce Workman at Edelweiss Creamery (pictured at far right) and the milk of grass-fed cows from the local family dairy farms of Dan and Shelly Truttman, Bill and Roz Gausman, and Bert and Trish Paris (all pictured left to right along with Jeff Wideman, Maple Leaf Cheese – who will be doing marketing for the group). One of the goals of the new cooperative is to offer great-tasting cheese different than anything else currently on the market. Dan Truttman, who farms near New Glarus, predicts consumers will be able to see and taste the difference that grass-based milk offers. The graziers have been dreaming of offering their quality product to consumers for several years. Bert Paris told me the group is extremely excited to have a quality cheesemaker wanting to make their grass-based milk into cheese. For those of you in the know – Bruce Workman is the only cheesemaker in the United States making 180-pound big wheel Swiss – the group hopes that some of those wheels will be made – in time – from grass-based milk. This small but plucky group of innovative farmers is a good example of how more and more dairy farmers continue to find innovative ways to respond to industry demands. With more consumers seeking signature cheeses with bolder flavors, I predict grass-based cheeses are next on the horizon to help meet that demand.